Location. 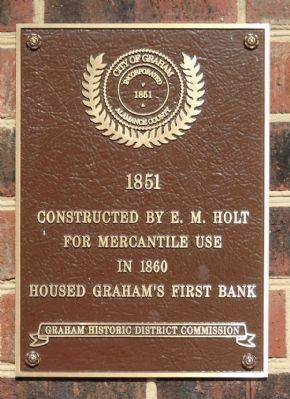 36° 4.139′ N, 79° 24.028′ W. Marker is in Graham, North Carolina, in Alamance County. Marker is on SW Court Square, on the right when traveling south. Touch for map. 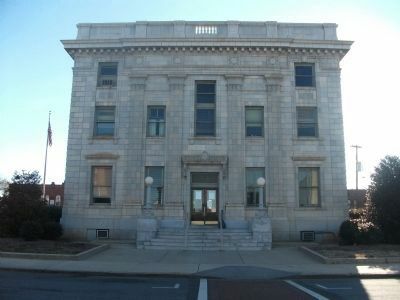 Marker is at or near this postal address: 38 SW Court Square, Graham NC 27253, United States of America. Touch for directions. Other nearby markers. At least 8 other markers are within walking distance of this marker. 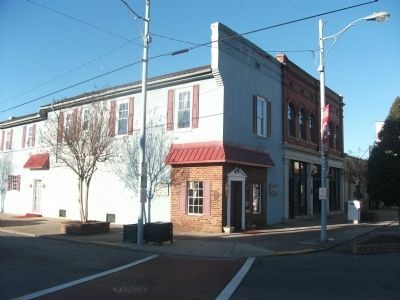 National Bank of Alamance (a few steps from this marker); Alamance County Courthouse (within shouting distance of this marker); Alamance County Confederate Memorial (within shouting distance of this marker); "Elmhurst" (about 300 feet away, measured in a direct line); Vestal Hotel (about 300 feet away); Wrike Drug (about 400 feet away); Originally a Wing of the Union Hotel (about 500 feet away); The Harden House (about 600 feet away). Touch for a list and map of all markers in Graham. Across the street from this marker. More. 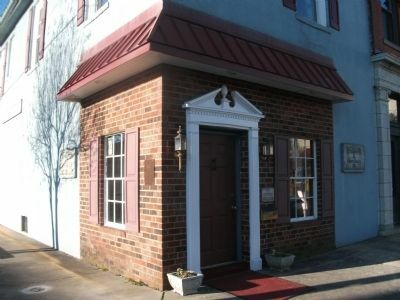 Search the internet for Graham's First Bank. Credits. This page was last revised on June 16, 2016. This page originally submitted on May 21, 2010, by Paul Jordan of Burlington, N. C., U. S. A.. This page has been viewed 693 times since then and 4 times this year. Photos: 1. submitted on June 29, 2010, by Paul Jordan of Burlington, N. C., U. S. A.. 2, 3, 4. submitted on May 21, 2010, by Paul Jordan of Burlington, N. C., U. S. A.. • Kevin W. was the editor who published this page.